SUNNYVALE, Calif.--(BUSINESS WIRE)--Quiet Solution, the market and technology leader in soundproof drywall, today announced that its revolutionary QuietHome® sound-damped floor/ceiling assembly has been awarded UL assembly number L591. This makes it immediately usable in a wide range of commercial and residential applications requiring stringent fire ratings, such as multi-family construction and high-end single family homes wanting high performance soundproofing solutions. The QuietHome assembly delivers superb noise reduction, with an STC rating up to 65 and an IIC rating up to 70. The STC rating is a measure of sound transmission through the assembly, and the IIC measures how much ‘impact’ noise is heard in the unit below. These assemblies are particularly good at reducing notoriously challenging ‘high heel footfall noise,’ with results 20-30db better than conventional assemblies. Overall, these new assemblies deliver a very significant performance improvement of 5-8 IIC points and 8-9 STC points versus conventional poured gypsum concrete assemblies. This can reduce impact noise by half, and airborne noise by two-thirds. By eliminating the use of the poured gypsum concrete that is used in conventional solutions, the QuietHome assembly reduces mold risk, schedule risk, and the likelihood of acoustic short-circuits. The QuietHome assembly is also half the weight, allowing for less material, and simpler, less expensive structural engineering. QuietRock® and QuietWood-based assemblies may also be eligible for LEED points, as LEED recognizes the importance of reduced use of materials and embodied energy, as well as of good acoustics. Pinn Brothers Fine Homes, a major builder in the San Francisco Bay Area, is building hundreds of new QuietHome units with Quiet walls, floors, ceilings and windows. “Using Quiet products has allowed us to build superior homes, simply, reliably and economically,” said Dale Garren, vice president. “These products helped us consistently reduce the noise between units beyond what building code requires, and outperformed older approaches. Building quiet is definitely cheaper than facing litigation over noise issues, and the total cost is lower using Quiet products than any other combination of materials and construction techniques would be. Best of all, our customers are satisfied, commenting often about how quiet their homes are.” Additional details on Pinn projects are available at QuietSolution. Quiet Solution pioneered the soundproof drywall category in 2002, and has held the #1 leadership position every year since, with over 90% of product sales and more than 30,000 projects. The company has 23 filed patents and produces over 25 Quiet®-brand products. 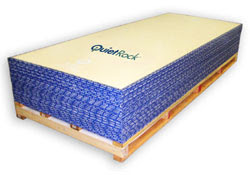 The low total cost, simplicity and reliability of the QuietRock® product line has made it a popular choice for hotel, commercial and multifamily construction, as well as residential remodels.